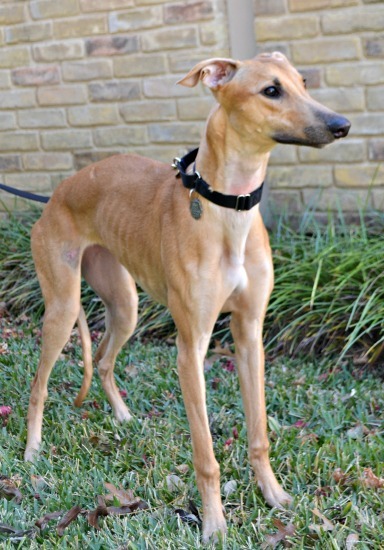 Phoenix, formerly Christy Ellin, is a 1-year-old fawn female born in March 2014. She was surrendered along with four of her littermates (Riddick, Levi, Countess Aliesha, and Tyrion) and four younger puppies from another litter (Valentino, Petey, Helaku, and Medley). All the puppies were thin and had intestinal parasites. Phoenix was medically treated and is hale and healthy now! She passed an initial cat test and has lived in a foster home with cats. Phoenix was in a home for three months, but was not getting along with the very small dogs. From Christy Ellin's namer: I would like the name of lime collar girl to be "Christy Ellin". Her first name is in honor of Dr. Christy Soileau of VCA Preston Park Animal Hospital, who has given such loving care to many of our greyhounds including many of my own fur babies. 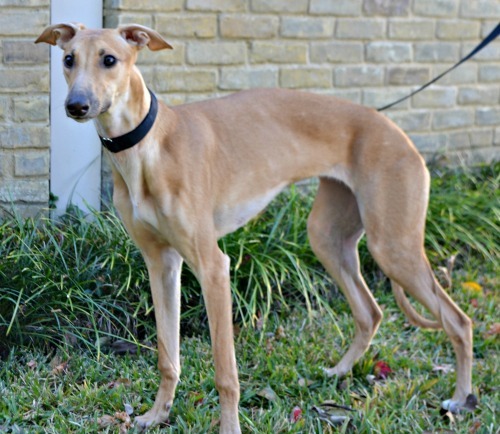 Her middle name "Ellin" is in honor of Dr Jeffrey Ellis ("Ell"), the medical director of VCA Preston Park Animal Hospital, who has treated and cared for hundreds of our greyhounds and lovingly cares for some of my own. 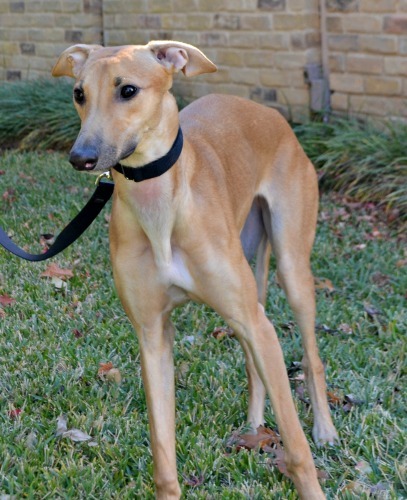 The last part of her middle name, "lin" is in honor of Lin Grado who jumped in to foster this sweet "little" girl when GALT received all of these Baytown puppies. I am so proud to be a member of the "GALT Village".